Acacia powder is what you get after you grind acacia gum, which is a product of the acacia tree, an evergreen which is a member of the legume family and is endemic to Africa. High in soluble-fiber, it is available as a dietary supplement – may it be via capsule or tablet forms. Australian acacias are called “wattles” because they have pliable branches that can be interlaced into the structure of wattle houses and fences. Acacia has been generally recognized as safe (GRAS) for use in food products by the United States Food and Drug Administration (FDA). A dosage of five grams of acacia daily for four weeks is usually recommended for treating disorders. 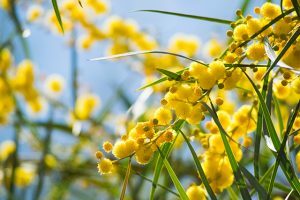 People who are allergic or hypersensitive to pollen especially mimosa, bee pollen, and other inhalants should avoid ingesting acacia. Acacia should also not be taken by pregnant women for medical literature of what its effects might be to an unborn fetus have yet to be published. For all its medicinal benefits, acacia can still cause some minor side effects. For instance, the intake of Acacia senegal can result in gastrointestinal disturbances such as bloating, flatulence, mild nausea, and loose stools. Also, taking Acacia catechu along with other substances that contain high amounts of tannins increases the risk of developing esophageal and oral cancer. If you are allergic to dust, taking acacia can make you develop lesions or experience asthma attacks, at least initially, according to a study conducted by Purdue University. Acacias have antimicrobial properties. As such, they are incorporated in chewing sticks to provide the gums with antimicrobial activity against Streptococcus fecalis. It can also treat visceral leishmaniasis, which is caused by the protozoan parasites of the Leishmania genus and which is characterized by severe fever, swelling of the spleen and liver, anemia, and significant weight loss. Acacia regulates cholesterol levels in the body, thereby preventing the onset of diabetes. Acacia is good for the skin. It can be used as a base ingredient for the manufacture of astringents and has a score of uses for cosmetic applications. It also can supposedly temper the negative symptoms of leprosy on the skin. Acacia is good for the hair and scalp. It can be used to treat dandruff and kill lice in the head. Acacia is good for dental health. It can be used to treat gingivitis, which causes redness and swelling of the gums. Also, chewing a stick of Acacia arabica every day for seven days can be effective for treating plaque. Acacia promotes the loss of body fat as it is high in fiber content, which gives a person the feeling of being full so that he doesn’t get to eat so much during his next meal after ingesting acacia. According to the University of Maryland Medical Center, acacia can help you get your recommended daily intake of fiber. As a matter of fact, in a study that was published in 2012 in Nutrition Journal, researchers said that participants who ingested 30 grams of gum Arabic, which is derived from acacia powder, every day for six weeks reported lower body mass index count, and a reduction of over two percent of body fat. Acacia has cancer-fighting elements and anti-inflammatory properties. Acacia is good for the cardiovascular system. It addresses the formation of blood clots, which can sometimes contribute to the occurrences of heart attacks, strokes, or other serious heart ailments. Acacia is good for the reproductive systems. Studies say that it can be used as ingredients for contraceptives. Supposedly, it can also be used as an ingredient for treating sexually-transmitted diseases such as mouth sores. Acacia is good for the excretory system. Ingesting it can prevent the onset of hepatitis, an inflammation of the liver, and can help stave off renal failure. Acacia is good for the immune system. It supposedly can ease the symptoms that are felt by people who are afflicted with human immunodeficiency virus (HIV). It also strengthens the body’s immune response against infection. Acacia is good for the digestive system. It can address gastrointestinal issues such as indigestion. Acacia is good for the respiratory system. It can help treat the effects of pharyngitis. Modern Birth Control: Blessing or Barbarism? Acacia is good for the cardiovascular, reproductive, excretory, immune, digestive, and respiratory systems.